Jess Graves, Thomas Alan Holmes, and Ernest Lee, eds. As witnesses to the special gratitude, generosity and humility Jeff Daniel Marion continually offers to fellow travelers as well as his craft, place, and time, Jesse Graves, Thomas Alan Holmes, and Ernest Lee are the perfect editors to bring us the first full-length collection focusing solely on Marion’s work. The result is a gathering of scholarship that inspires new scholarship while also inviting us to join an old-fashioned gathering. We enter excited, feel at home, converse, grieve, celebrate, and leave wanting more of everything. Johnson also considers here the poems “Unnamed,” “Riving,” “Waning,” “Boundaries” and others from Marion’s Chinese poems. In an observation that reminds us how close Marion is to the very origin of Appalachia’s literature wellspring, Johnson observes that the speaker in “the bulk of Jeff Daniel Marion’s poems is the living embodiment of the message Jim Wayne Miller’s Brier delivers in ‘Brier Sermon’: one must be firmly grounded in one’s homeplace…before he can attain a proper perspective in the world” (58). For more than four decades, Jeff Daniel Marion has proven “firmly grounded” in his homeplace and able to share a “proper perspective,” from childhood days in Detroit to a lifetime spent on the Holston river. And always he has written of Appalachia’s heart and history. Situated within a greater community and universal history, Marion writes of the ties of home, love, the natural world, the passage of time, place, decay, and all the loss inherent in what we must embrace in order to live a life worth celebrating. 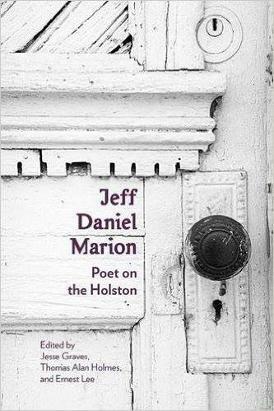 Jeff Daniel Marion: Poet on the Holston creates a new dimension to reading the poet’s work. An essay by Randal Wilhelm on the art of the visual considers Marion’s long relationship with photography, which even readers familiar with Marion’s poetry may not fully appreciate. From boyhood, Marion has been fascinated with the craft and style of photography, and Wilhelm’s essay encourages us to view Marion’s photographs as an art in themselves and as a complement to Marion’s written work. And if we consider Johnson’s treatment of the Chinese poems and Wilhelm’s assessment of Marion’s photography, we hear individual reflections speaking to each other in ways we have not heard before. Structuring the collection in this way reflects Marion’s own approach to poetry and the world; that is, seeing and ordering the parts to make a whole and the expansive vision that whole suggests. Beautifully introduced by Lee’s “The Journey a Poet Makes,” and followed by Marion’s “Land of Lost Content,” a stunning retelling of select autobiographical events both dated and in non-linear time, Jeff Daniel Marion: Poet on the Holston brings together wide-ranging thematic studies including: (1) The Poet’s Sense of Place” (2) “The Poet’s Evolving Voice” (3) “The Poet’s Wide Reach and Expansive Vision” and (4) “The Poet as Teacher and Mentor.” Structuring the collection in this way reflects Marion’s own approach to poetry and the world; that is, seeing and ordering the parts to make a whole and the expansive vision that whole suggests. Robert Morgan examines Marion’s expansive vision through his interaction with place. An exquisite example of this is Morgan’s humorous retelling of a failed fishing trip he and Marion took over 40 years ago in the Great Smoky Mountains. After being “ignored” and “humiliated” by large, “contemptuous” trout looking right at them all day, the men refuse to quit and walk “further upstream toward the headwaters, where the stream was coldest, fed by mountain springs.” In a short while, “sweaty and exhausted” they stop when a rain Morgan describes as “delicious” began to “pound the trees and ground.” Though unlucky in their catch, this fishing trip reveals both writers as living the poetics of place. They take in all the parts and celebrate the whole. In “Constructing ‘The Arbor’: Absence, Place and Memory as Poetic Strategies,” Allison Cooper Davis dives into the deep water of time and finds loss as well as a way of re-creating what is gone: “Language’s specificity and the use of memory and imagination to reconstruct story allow the Poet to chronicle not just [his] Uncle Gene, but to assert himself, his history, and his connection to the community in the form of family.” The speakers in Marion's collection Letters Home transform loss “from an act of mourning into a moment of celebration”(90). Davis gives special attention to Marion’s complex handling of language when dealing with place. Marianne Worthington, also focusing on Letters Home, examines language performing the role of continuance in the face of “eroding memories” long after individual lives and voices have passed from the world. More specifically, her essay complements Davis’s argument by asserting that it is lyricism married with strong storytelling that reveals a more “public poet” whose role as “poet-storyteller” is a crucial one for understanding Letters Home as well as Marion’s handling of personal and communal loss. Jeff Daniel Marion's devotion to the power of words and stories has created the assembly of speakers and listeners gathered in Jeff Daniel Marion: Poet on the Holston. Already a longtime student of Marion's poetry, I felt a much more attuned listener in such a "community of listeners." I will return again to the pages of this collection and to the poetry of Jeff Daniel Marion. Bethann Bowman coordinates the minor in Appalachian Studies at Young Harris College and serves as the Interim Director of the Center for Appalachian Studies and Community Engagement. She also directs the college’s student leadership and engagement program. Some of her work has appeared in Eva Mag and Iron Mountain Review. She earned the Ph.D. from the University of Tennessee in 2012. Passionate about the history, culture, literature and contemporary life of Appalachia, Bowman is equally excited about understanding larger Southern identity and working on social justice issues, especially those affecting Appalachian communities.